James Saxon ‘John Clerk of Eldin’, Scottish National Portrait Gallery Born the seventh son of Sir John Clerk of Penicuik, John Clerk of Eldin inherited much of his father’s thirst for knowledge. 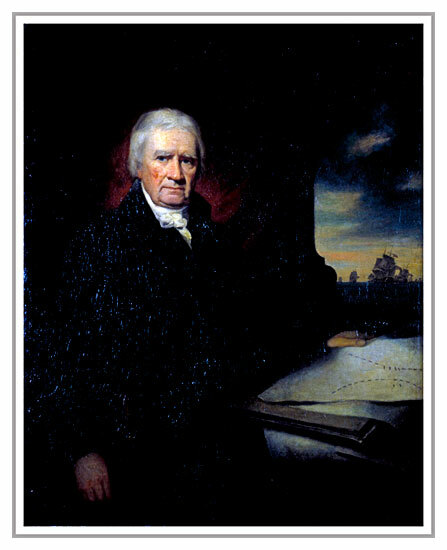 Educated at Dalkeith Grammar School he was an industrious student though unlike his Father, John Clerk never travelled abroad to complete his education, but went on to study anatomy at Edinburgh University. Important early connections in his life were his friendship with the architect Robert Adam (he married Robert’s youngest sister Susannah) and through him, with the English artist Paul Sandby. The Clerks had become closely connected with the Adam family, who owned and operated one of the most important building businesses in Scotland. William Adam, Robert’s father, had improved the Clerk home of Penicuik House and he was subsequently commissioned to build Mavisbank House for them. William Adam also held the key contract from the government for the expansion of Fort St George, a military fort on the Moray Firth. It was in their time at Fort St George that the Adams were introduced to Paul Sandby who was working there as part of the Board of Ordnance, the body responsible for military infrastructure and mapping. It was therefore through the Adams that John Clerk met Paul Sandby. Indeed, Robert Adam, Sandby and Clerk are known to have taken drawing trips together. Drawing was something that Clerk learned at any early age. His father regarded it as an essential skill, mainly for military use (though Clerk never joined the military). Clerk turned out to have natural talent for drawing and, with assistance from Sandby, came to be better than most. Their subjects focused on historic buildings and are topographical in nature. Clerk’s style of the handling is, as it is in Robert Adams’ early work, influenced by Sandby as well as European masters whose prints and drawings were highly collected. With Sandby and Robert Adam’s support, Clerk was persuaded to take up etching. Although Clerk would have known Sandby's own etchings, Clerk himself does not mention any teachers and so we must consider him as self taught. His early career was seemingly haphazard, a trial and error education. Overall, Clerk of Eldin went on to produce over one hundred and ten etchings, from the first impressions from around 1770 to the last in 1778. It is difficult to say exactly when he started etching; he states himself to have commenced at age forty five, that is in 1773, but as dated works of 1772 survive, this is unlikely. The standard even in 1772 is too high for a complete beginner. Clerk made sets of etchings to sell, though this was at a time well before any concept of formal editions. He printed up to order. Many sets were sold via Thomas Philipe, a print seller with a shop opposite the Tron Church in Edinburgh who was eventually given the task of doing the actual printing from Clerk’s plates, Clerk often struggling to get good enough impressions himself. His images, handled in a style that owed much to European master printers, from Claude Lorraine to Franz Edmund Weirotter, capture the castles and ruins of Scotland in a fine picturesque manner. They are of a surprisingly high quality for an amateur printmaker. Clerk was well known and well respected in the Edinburgh area, and like many gentlemen from the Age of Enlightenment, was involved in a wide variety of activities and business interests. He wrote a book on naval tactics that arguably changed the way in which the Admiralty fought their sea battles. And through his friendship with James Hutton, a fellow student and friend from University days, he provided the illustrations for Hutton’s influential book ‘Theory of the Earth’. On Clerk of Eldin’s death in 1812, the collection of prints and plates were retained by his family, and in 1825, with the help of his son, John Clerk, then Lord Eldin, the Bannatyne Club of Edinburgh issued a volume of etching called 'Etchings, Chiefly Views of Scotland by John Clerk of Eldin'. This publication contained twenty-six views. In 1855, the Bannatyne Club published another issue, this time with seventy-six etchings, as additional plates had been discovered at Eldin. It is understood that The Bannatyne Club then destroyed the plates, their quality having seriously deteriorated.